Following in the footsteps of Coachella, the 12th annual Austin City Limits (ACL) Music Festival doubled its attendance at Zilker Park this year by expanding its usual three-day concert to two identical line-ups on consecutive weekends in early October. For sound reinforcement duties on one of the festival's largest stages--known as AMD on the first weekend and Lady Bird on the second--Houston-based LD Systems chose to deploy a full L-Acoustics K1 loudspeaker system. "For huge outdoor festivals like this, there's nothing better than L-Acoustics' K1 because of its incredible throw capability and sound," Ausmus notes. "ACL capped its audiences at 75,000 per day, but when big headliners like Depeche Mode performed, literally 90 percent of the day's crowd showed up at our stage. The people at the back end of the park weren't getting 'in-your-face' audio, of course, but the good news is that they did hear highly intelligible music, which is amazing at that distance. K1 was the perfect solution." 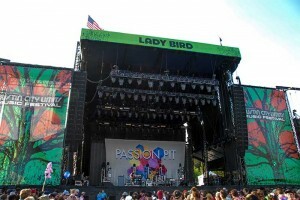 Named after the long-running PBS concert television series, Austin City Limits Music Festival featured eight concert stages and completely sold-out both weekends this year.